ISPE, a global not-for-profit association of 25,000 pharmaceutical manufacturing professionals, along with INTERPHEX and Pharmaceutical Processing magazine, named Genentech's Oceanside Product Operations Facility the overall winner of the 2007 Facility of the Year (FOYA) Awards during the Keynote Session at the November ISPE 2007 Annual Meeting held in Las Vegas, Nevada, US. Genentech is a leading biotechnology company that discovers, develops, manufactures, and commercializes biotherapeutics for significant unmet medical needs. Genentech received U.S. Food and Drug Administration (FDA) licensure in April to manufacture bulk Avastin® (bevacizumab) drug product at the Oceanside Facility. Avastin® is the first FDA-approved therapy designed to inhibit angiogenesis, the process by which new blood vessels develop and carry vital nutrients to a tumor. 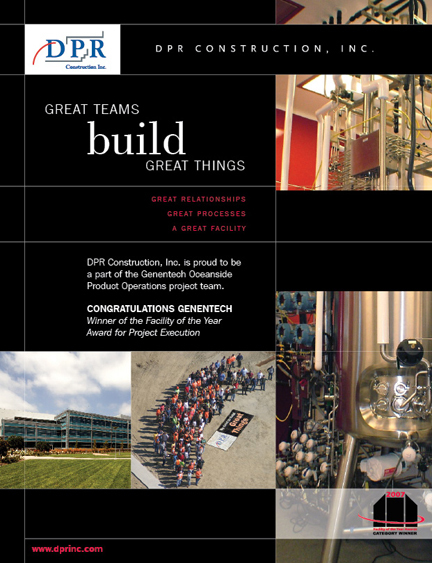 Genentech's Oceanside Facility was named the overall 2007 Facility of the Year Award winner largely due to the Design-Build Hybrid approach and people-oriented execution focus the team delivered – on time and under budget. It is a facility that features unique innovations, design advancements, and quality attributes, including large-scale modular construction (super skids), an advanced degree of automation systems, a high level of system integration, flexibility and adaptability within the manufacturing building, and expandability of each functional area. “This award serves as great recognition of the teamwork and quality of work of the many people who have contributed to bringing this facility on line to produce Avastin® for thousands of cancer patients,” stated David Broad, Vice President and General Manager of Genentech's Oceanside Campus. The Facility of the Year Awards (FOYA) program recognizes state-of-the-art pharmaceutical manufacturing projects that use new and innovative technologies to enhance the delivery of a quality project, as well as reduce the cost of producing high-quality medicines. Now in its fourth year, the awards program effectively spotlights the accomplishments, shared commitment and dedication of individuals in companies worldwide to innovate and advance pharmaceutical manufacturing technology for the benefit of all global consumers. The deadline for submissions for the 2008 Facility of the Year Awards program is 30 November 2007. The on-line submission form can be accessed at 2008 FOYA On-line Submission Form. For complete information about the awards program and submission procedures please visit http://www.facilityoftheyear.org. ISPE, the International Society for Pharmaceutical Engineering, is the Society of choice for 25,000 pharmaceutical manufacturing professionals in 90 countries around the globe. ISPE aims to be the catalyst for "Engineering Pharmaceutical Innovation" by providing Members with opportunities to develop technical knowledge, exchange practical experience, and collaborate with global regulatory agencies and industry leaders. Founded in 1980, ISPE has worldwide headquarters in Tampa, Florida, US; its European office in Brussels, Belgium; and its Asia Pacific office in Singapore. Visit http://www.ISPE.org for additional Society news and information. The INTERPHEX Conference and Exhibition is the world's largest gathering of professionals and technology providers for the pharmaceutical manufacturing industry, now in its 29 th year. Scheduled for 26-28 March at the Pennsylvania Convention Center in Philadelphia, Pennsylvania, US, the 2008 exhibition will feature more than 950 exhibitors, an expanded conference program, and a high-profile roster of industry professionals and speakers. INTERPHEX is the world's most trusted source for insight into issues, education, products and services, with a wealth of innovative strategies and solutions for company and project success. For information, visit http://www.interphex.com. Pharmaceutical Processing magazine is the pharmaceutical industry's leading information provider, reporting on a full range of innovative new products, equipment, technology and trends for 31,000 engineers and managers responsible for the development, manufacture, validation and packaging of pharmaceuticals. An official sponsor of INTERPHEX, Pharmaceutical Processing distributes critical information to these professionals in a timely manner through a full range of print, electronic and on-line media. For information, visit http://www.pharmpro.com.